Karat at a career fair in 2017. Fall recruiting season is in full swing. Every campus is buzzing with the excitement of back to school, new course loads, and of course, career fairs. 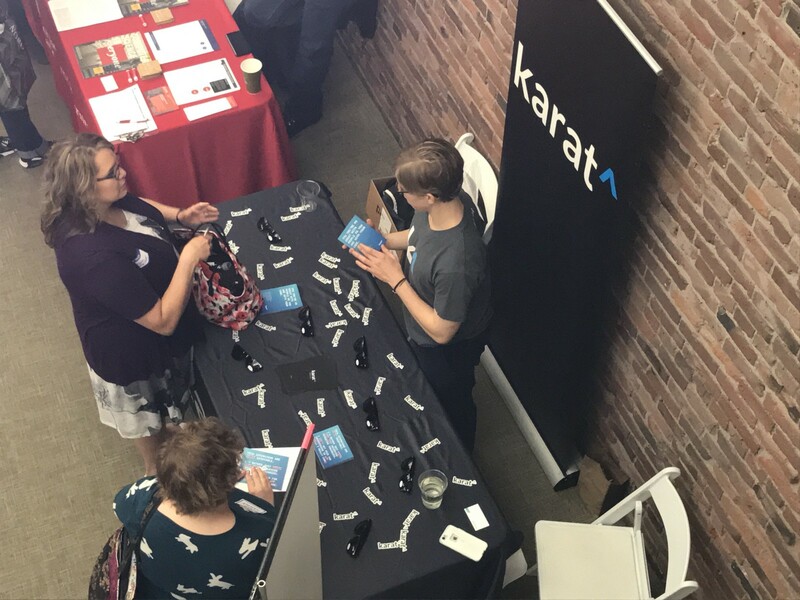 As Director of Talent Acquisition at Karat, I’ve recruited dozens of students and new grads into our software engineering team over the years. Prior to Karat, I spent four years recruiting students and new grads at Microsoft. I always remember approaching the Fall recruiting season with a mix of excitement and intimidation. Upon reflection, I felt intimidation because I knew there would be companies competing with me using new and innovative strategies each year. But, more importantly, I was excited because there would be a new brilliant talent pool that I would get to develop a relationship with and hopefully onboard to my company. As your team is hustling through Fall, I want to share some of the best practices I’ve gleaned from my time in university recruiting. If you want to secure top tech talent, here’s what you’ll need to do. 1. Develop relationships with underclassmen. The interns of today are your full-time hires of tomorrow. Building a strong internship program for students at all stages of their degree program will help your company achieve hiring goals in the future. It may seem to make sense to focus exclusively on juniors and seniors, especially if you have limited resources. However, you can begin to develop relationships with freshman and sophomore students who will be your full-time hire candidates two or three years down the road. Creating relationships with students becomes more difficult as they progress in school. This is because they end up getting internships with other companies and developing strong connections with them. The student who couldn’t get anyone to talk to them in their freshman will someday be a junior struggling to figure out how to keep up with classes because they have several interviews every week for the entire Fall. Instead of waiting to be one of the many companies vying for attention, consider starting the conversation much earlier and accepting underclassmen interns. Sure, it seems like an investment into relationships that have a delayed or uncertain payoff, but it can come with many benefits. Creating a lasting and positive impression. Hiring sophomore interns will leave them with a positive impression of your company because your recruiting team didn’t overlook them. Developing a brand ambassador. Freshman and sophomore interns can be your ambassadors on campus for the rest of their college careers just by sharing their experience with their fellow students. Being top of mind when the student is looking for a full-time job. It will be easy for you to reconnect and stay on their list (a luxury you’ll have to fight much harder for as they progress through school). At Microsoft, I had the good fortune of hiring two exceptional underclassmen from Penn State, both outstanding freshmen. Not only did they return for internships every summer, and ultimately accept full-time roles, but they brought in a steady stream of strong referrals. They often recalled that because we took a bet on them earlier it built an increased sense of loyalty. 2. Highlight the compelling and innovative tech your company is developing. I’ve hosted more company info sessions than I can recall (or would care to! ), ordered more pizza than most will in a lifetime, and given away enough t-shirts to clothe a small country. In the midst of one particularly competitive season during my time at Microsoft, I recall observing a crowd at an info session at the University of California San Diego. I looked around and thought to myself, “I wonder how many people in this room are actually hiring targets?” To put it bluntly: how many of the 150 students who are attending this event will get hired if I interview them? I looked at our sourcing data and was only mildly surprised to see that an embarrassingly small percentage of hired candidates met us at an info session. We were investing a lot into events that mostly attracted candidates who weren’t sure if they had an interest in the company. So, I ditched info sessions and refocused on the big problems we were trying to solve that required massive innovation. The best software engineers are eager to learn how difficult problems are being solved. So we used our time on campus to discuss the problems they were working on. Not only did this attract a more focused group, but it was an effective way to identify whether or not their interests and aptitude align with the company’s challenges. 3. Take constraints off of your technical interviewing bandwidth. We all know that feeling: your team has a group of perfect candidates who are intrigued by your company and the role. Unfortunately, they have fast-approaching deadlines with other companies and your team has to find someone to interview them. If you’re anything like me, you’ve probably shaken your fists at your laptop wishing this process could move faster. Most companies find that the lack of software engineers available to interview prevents them from achieving their hiring goals. It’s time to rethink the approach. In order to win the competition for students and new grads, you will need to increase technical interview bandwidth. Find technical hiring managers in your company who appreciate the competitive nature of university recruiting. Ask them to deputize technical interviewing leaders this Fall. These leaders will spend the majority of their time interviewing for two to three months, but it will certainly pay off. Use this as an opportunity to measure your technical interviewing and hiring process. Build basic systems and trackers to anticipate the volume of interviews and interviewers needed to achieve your hiring goals. Block out that amount of time with those interviewing leaders in advance. This is a big ask for software engineering, but it is a must-have to meet your hiring goals. 4. Measure and optimize your hiring funnel. Track your hires by source and question your assumptions. Make sure every candidate has a way to identify how they found you. Years ago, while recruiting for Microsoft at Carnegie Mellon, I decided to dig into the assumption that the best candidates come from one very popular program. I found that while the majority of hires did come from that popular program, a significant number were coming from a more obscure program. That year, I spent more time and resources recruiting from the obscure program. Ultimately that once obscure program came to represent an equal number of hires as the previously popular program did. Know your hiring bar. Understanding your hiring bar makes it possible calibrate your technical interviews to it. This will give you a better idea of how a candidate will perform onsite and on the job. Tracking the outcomes from your technical interviews, by interviewer, in both first and final rounds can uncover insights that will help your technical interviews get smarter and more predictive over time. Know your funnel. Like so many things, this is one that often feels more difficult to wrangle in the high volume university recruiting space, but it’s just as important than the funnel tracking your industry recruiting peers are doing. If you have the ability and resources, I recommend building a funnel tracker that integrates with your applicant tracking system (ATS). This funnel tracker should update in real time and show you how many first-round technical interviews need to be completed in order to reach your hiring targets. 5. Rethink the resume review in order to hire more inclusively. Your team will have to sort through hundreds of resumes during recruiting season. Without a doubt, they’re wondering how they’ll narrow the stack down to the few that you plan to interview. It’s tempting to fall back on the quick sorting tactics that make that huge pile less daunting. We might look for students in certain classes, TA groups, or from the hottest internships. Unfortunately, this simple sorting often overvalues a rather mild signal and continues to favor the same homogenous profile, over and over. We want to hire great software engineers, not great resume writers. If you’re serious about hiring more inclusively and creating a more diverse talent pipeline, it’s time to consider allowing the technical interview to play a much more significant role in identifying talent at the top of the funnel. Establish how much time you have to conduct technical interviews and then commit to filling a portion of that time with candidates who didn’t meet that overvalued criteria. So long as your interviews are structured, consistent, and focused on ability and not pedigree — I’m confident you’ll be surprised by the results.